In the late 1960s, small "estate" cars were emerging as practical transportation with good carrying capacity. Most were hatchbacks like the Austin 1100, the Peugeot 204, and the Renault 16. Opel was also working on an Opel Manta variant. BMW was looking for ways to further capitalize on the 1600/2002 platform, and they also wanted to offer a hatchback to compete in that segment. In 1967 BMW purchased the Glas automobile company, and it had a small hatchback in the lineup which had dismal sales. However, the car was used as the basis for the design proposal solicited from Bertone and Michelotti. It took until 1971 for the cars to reach production with the first 2002-based ones actually badged as 2000 Touring, and 2000tii Touring. Other than the body, the cars were identical to the regular 2002s. Engine, transmission, suspension, and electrical were all the same. On the body, the cars were virtually the same up to the A pillar. Facing the cars head on, you would be hard pressed to tell a Touring from a Coupe/Sedan. The rear overhang was shorter to give the rear good proportions, and there was strengthening to make up for the absence of the rear bulkhead. It retained the signature Hofmeister kink, and a generous greenhouse. The angle of the windshield was changed to better suit the body style. A signature feature are the ventilation grilles on each rear pillar. 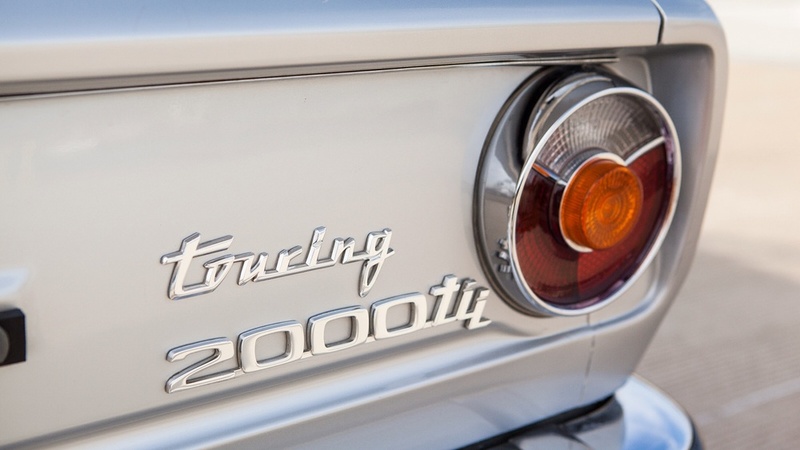 Despite continuing until April of 1974, and getting all of the running gear updates from the 73 Model, the Touring models kept their round tail lights. For the interior, the changes began behind the front seats, with split fold-down rear seats. The front seats stayed with the 71 Model seats until the end, much like the round tail lights. Standard materials were vinyl with houndstooth cloth inserts. More than 30,000 Touring models were produced in 1600/1602, 1800/1802,and 2000/2002 variations over the 3 year period in which they were made. The 2000/2002 models were the vast majority of that number. In 2012, BMW Classic fully restored a 1972 2000 Touring to as new condition (with a few upgrades like 170bhp ! ), but there are also lots of variations out there that never came from the factory such as Alpina versions and a Turbo version. No such version ever left the factory, but nicely done !